Arriving at Kampung Naga, visitors are treated with the views of rows of unique houses of Kampung Naga local residents. 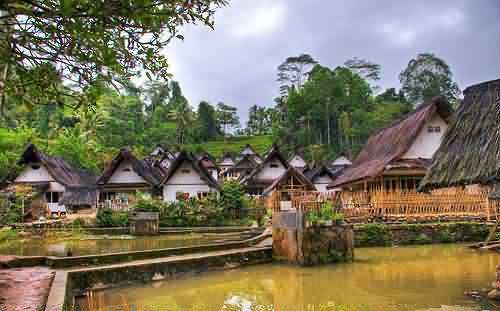 The houses are thatched-roofed and wooden-walled with bamboo matting. The structures and foundations of every buildings owned by residents of Kampung Naga tailored and made to the Sundanese philosophy. The buildings were built like a human body structure. Each building consists of suku(legs), awak(body), and the sirah (head). Each section is defined as a moral manner that should be done by people. Namely, tekad (intention), ucap(words), and lampah (deeds). The uniqueness of the building is also in the way of installations. The roof is firmly attached to the roof. In fact, these roofs withstand an earthquake even though the roof was installed without nails. Strands attached to the roof of the house with the bamboo series of buffer called garumpai. Garumpai serves to maintain the unity of the roof construction. Garumpai is so flexible that it can follow any movement during an earthquake. 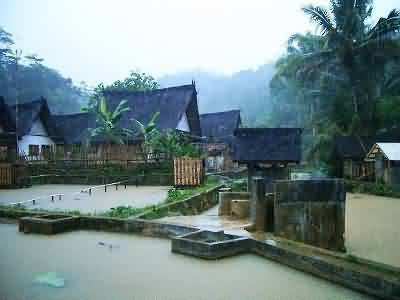 The traditional house of Kampung Naga stood on rocks that are not casted or planted into the ground. The main pillars of the house just heaped on the stone. The construction can be very dynamic to follow the vibrations. Each section has an important function. All three had to stand together unseparated from each other. All the buildings in the village area of 1.5 hectares are arranged neatly. The size does not change from time to time. Added inhabitants are transferred out of Kampung Naga or called Foreign Naga. Currently, the area is inhabited by 314 people. The east boundary of Kampung Naga is the River Ciwulan. The west by hills and forbidden forest. The north and south adjacent to the ditches. Among the total 113 buildings in the area of Kampung Naga, there are four main buildings that are considered important. Namely, bale ageung, bale kampung, mosque, and leuit (barn).